If you would like to follow my latest financial journey, you can get my updates sent directly to your email, via Twitter (where I have been more active lately) and/or you can sign up for the monthly Million Dollar Journey Newsletter. In my first few Financial Freedom updates, I talked about what life has been like since becoming a millionaire, why I like passive income, and our family financial goals going forward. Our current annual recurring expenses are in the $52-$54k range, but that’s without vacation costs. However, while travel is important to us, it is something that we consider discretionary (and frankly, a luxury). If money became tight, we could cut vacation for the year. In light of this, our ultimate goal for passive income to be have enough to cover recurring expenses, and for business (or other active) income to cover luxuries such as travel, savings for a new/used car, and simply extra cash flow. In the last update, we showed good progress in reaching $41,050 in annual dividend income. There was quite an increase in dividend income during that update due to taking advantage of many quality dividend stocks hitting annual lows. Where did the summer go? It was quite a busy summer between visitors and some renovations to the basement. We decided that 10 years is long enough to wait before getting the basement developed. The basement will give the growing kids some more space and more space for when out of town/province friends visit. With a slow down in the local housing market, our original builder gave us a fair price to fully develop the basement. We were pleased that the builder was able to complete the project on time and on budget. Renovations aside, what about my financial freedom aspirations? Let’s talk a bit about my passive income strategy – generating dividend income. As dividends are the main focus of my passive income pursuit, there is a large dependence on the market. While there are merits to this investment strategy, there are also substantial risks – particularly dividend cuts. Fortunately, there haven’t been any recent cuts. Riocan (REI.UN); Telus (T); Canadian Utilities (CU); Canadian National Railway (CNR); Kimberly Clark (US: KMB); Metro (MRU); Chevron (US: CVX); Exco Technologies (XTC); Manulife (MFC); Suncor (SU); Bell Canada (BCE); Great-West Life (GWO); Brookfield Infrastructure Partners (BIP.UN); Coca Cola (US: KO); AbbVie Inc (ABBV); TransCanada Corp (TRP); Walmart (US: WMT); Magna (MG); CIBC (CM); Scotiabank (BNS); Bank of Montreal (BMO); TD Bank (TD); Husky Energy (HSE); Canadian Western Bank (CWB); AT&T (US:T); Visa (US: V); Abbot Labs (US: ABT); Wells Fargo (US: WFC); Power Financial (PWF); Transcontinental (TCL.A); Procter & Gamble (PG); Unilever (UL); Exxon (XOM); Johnson and Johnson (JNJ); Loblaws (L); Canadian Pacific Railway (CP); Sunlife (SLF); Apple (AAPL); Caterpillar (CAT); Target (TGT); Empire (EMP.A); Emera (EMA); Royal Bank (RY); Verizon (VZ). In addition to the dividend raises, I’ve continued to deploy cash into dividend stocks. In late 2017, I created a non-registered dividend portfolio for my spouse (opened another account with MDJ reader favorite Questrade). There has been some activity in this account with Enbridge (ENB) buying back it’s affiliate Enbridge Income Fund (ENF). If I were to leave this alone, I would end up with more shares of ENB which is already a top 10 position. In saying that, I sold the ENF shares and will be deploying that capital in the next couple weeks. As you can see in detail below, over the last quarter we have increased our dividend income from $41k to $43.5k which represents a 5.85% increase quarter over quarter and 72.5% of my goal ($60k). We are going for $45k in dividend income by the end of 2018.
iShares Core S&P U.S. Total Market Index ETF (XUU). Through a combination of deploying cash, continuing to build a new non-registered portfolio with savings, and collecting those juicy dividend increases, this quarter has been fairly productive with a 5.85% bump in dividend income. I really do enjoy watching those dividends flow into the accounts. Not only do I enjoy watching the dividends flow into the account, I’m also a big believer in compounding returns (see how compounding can make you rich). In other words, the dividend cash is deployed into more income-producing stocks which then further increases the income of the portfolio, which is then used to buy even more stock. See how compounding works? It’s only a matter of time before the snowball grows a mind of its own. I welcome corrections/volatility as it gives investors in the accumulation phase a chance to buy quality companies (or index ETFs) at better prices, potentially increasing long-term returns. My target of 45k in dividend income by the end of 2018 is in sight. We shall see! Currently, I hold a sizeable position in BCE and I somewhat subscribe to the Dog of the TSX strategy. Since you’re also following this strategy to a certain extend, I have a question for you. If a stock like BCE appears in the list almost every other year or so, do you have a criteria that you will get ride of it from your portfolio? The only reason that I haven’t got rid of it was their dividend increases. Hi Leo, I subscribe to the strategy of buy and hold. I will be holding BCE well into retirement and perhaps beyond. :) For my wife’s “dogs of the dow” portfolio, I would consider selling BCE if the stock price skyrockets thus bringing the yield down. I’m thinking though that it will remain in the portfolio for a long time to come. One very impressive feat! The dividend increase is absolutely amazing to watch. Would not be surprised if you actually make your target of $60k by 2020. Thanks for the support ! Nicely done Frugaltrader! Very impressive and that’s a large amount of money invested in dividend stocks. We’ve been getting around $1,600 each month for the last few months. Should be on track to hit $18,000 for this year. We have a long way to go to hit >$40k per year. Dividend investing following the Dogs of the TSX strategy must have taken a big hit recently in returns with the Canadian market. Do you plan to stay the course? Sorry missed this one, the account is currently squeezing out a small gain this year including dividends. Since the holdings are mostly blue chip companies that have a strong dividend history, I will be sticking around . Ahh your portfolio is over $1.2 million!! So amazing. $43K in passive income- fantastic! Are you guys using any of it right now (eg. for your basement renovation) or redeploying it into your investments? I will be so happy once I hit $1 million in my portfolio. I recently bought some emerging markets ETFs too and plan to add to this. 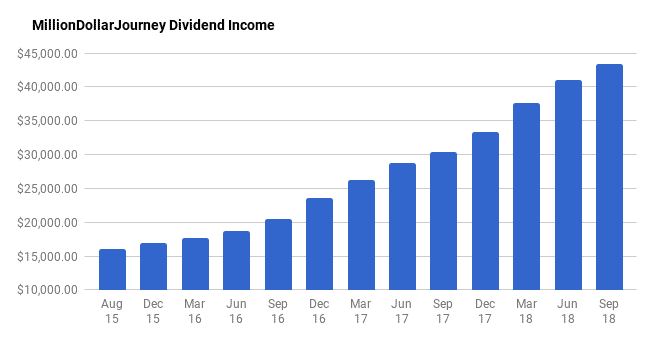 My month over month dividend income growth is also somewhere around 6% too! Hey GYM! We used cash savings to pay for the basement, but technically yes, that cash would have been invested eventually. But you know what they say, happy wife, happy life. :) You are also making big progress, which emerging markets ETF did you buy? XEC? Wow. Simply impressive and you continue to be an inspiration FT! If I had to add it all up for us, TFSAs, RRSPs, non-reg. we’re close to earning about $34k per year in our mid-40s. I hope to hit ~ $50k per year for some semi-retirement fun in the coming years; maybe age 50. We’ll have a small workplace pension ~$30k per year at age 65 for life so we figure $50k or so in dividend income should be enough money to live from assuming we work part-time in our 50s; keep body and mind active and work as we please. Continued success to you and best to family. Hey Mark, thanks for the kind feedback! Looks like you are heading for a VERY comfortable retirement, congrats! Also, don’t forget OAS (I believe that CPP is built into most federal pensions). What astounds me is the the $1.2M total value of the investment. I love the idea of dividend earning stocks, but to amass that total value seems daunting. Let’s assume you started with $300 000 total equity in your accounts (I got this from your starting $200 000 Net value and the original SM investment). May be way off, but i figured it makes sense to start with SOMETHING. I’m assuming 5% growth here from the dividend yield, which you re-invested. So in twelve years to go from $300 000 to $1.2million would require someone to invest $3500 PER MONTH. That’s $42 000 per year. Is this what you were able to do? If so, HOW? FT – Ron had a question that is relevant, but you haven’t answered. The dogs of the TSX have taken a beating. Do you plan to stay the course? Sorry about that, I missed that one. Just replied – check it out . Monster jump from 2013 to 2014; what was that attributed to? My gains in 2014 & 2017 was that I had more money to invest. I don’t recall a particular stock or fund that jumped. I sold a property in 2014 and re-invested some of the cash into stocks versus paying down the next mortgage as I considered the yield of ~4.5% to be better than the cost of carrying a mortgage at <3%. Most of my holdings are in CDN / US dividend paying stocks and emerging market / Europe ETF's. I haven't bought into any weed stocks or block chain / coin stocks. Congrats on the big growth in net worth! FT, impressive dividend income. On your yearly expenses, I’m reading from your July 2013 linked post that they are $52k-$54k/yr – is that updated as of Q3 2018? What’s been the impact to the portfolio with the blue chip dividend stocks taking a hit with the yield fears? Time to pick-up more now, or wait it out (maybe post mid-term elections, or post Santa Claus rally)? Working on building the passive dividend income stream and tempted to allocate some cash with this correction as the dividend yields have moved up nicely……for now. Portfolio value is definitely down but the bright side is that dividends are still flowing through ! Next post: Early Retirement on Dividend Income, which Province is the Best in 2018?